Think of marketing, think of brochures. Yes, brochures are the most effective marketing or promotional materials. This is because brochures are power-packed with pictures of the product range, product information and specifications, details of the company etc. Offering exhaustive information at a glance, the brochure is any company’s best bet for marketing. But brochure printing is not an easy job. a lot of things have to be taken into consideration before designing the brochure in order to ensure its complete success. 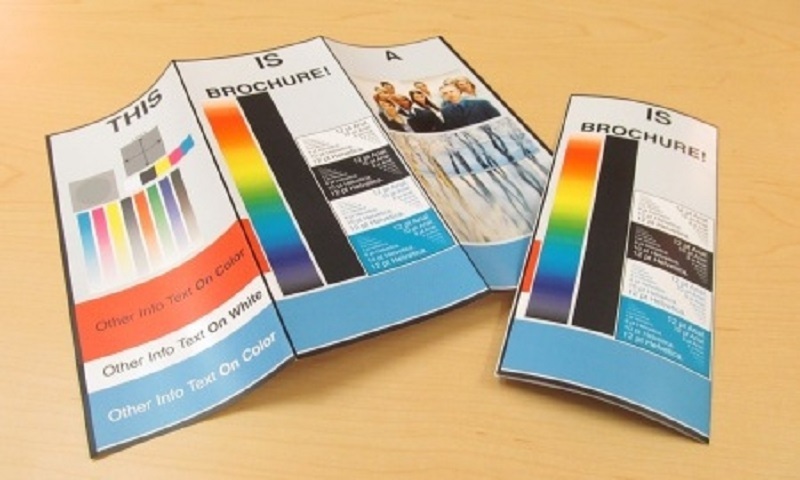 Here are some pointers for brochure printing. What is the purpose of your brochure? Decide this first. Is your brochure going to just market your brand or product? Or will it be a mini-catalogue type highlighting on all the prime products? Or is the brochure just an information booklet sharing details of your company’s achievements to your clients or shareholders? The purpose of the brochure is going to decide its design and its printing. Who is the brochure aimed? Who will read the brochure? If the brochure is aimed at customers and is a purely marketing brochure, it can consist of just 4 pages. If the brochure is to be distributed among important clients and business associates, it must be more informative and richly designed. If the brochure is targeted at stakeholders, it must be a robust brochure of dignified design and suitable thickness. Keep in mind the audience while brochure printing to ensure it is rightly designed and reaches the right customers. These Q factors are the ones that finally govern the brochure printing. Yes, the quality of the brochure with respect to the material being used and the texture etc. decide the printing process. The quantity is also a major factor that decides which printing technique is to be used. If the quantity is between 100-500, screen printing is the best. For numbers above 500, offset is affordable. Digital or laser printing give the best results at slightly higher rates. Is your brochure going to have a single fold, bi-fold or triple fold? Is it going to be a single colour or multi-colour? Is there going to be texture in the finish- matte or glossy? Is your theme going to be uniform throughout or is it going to change from page to page? Decide the brochure size, paper quality, folds and bleed. Finalize the colour tones to be used and the binding to be done- is it going to be saddle stitch, wiro bound or perfect bound? Always go in for a uniform thee from front to back while printing a brochure. This will only offer consistency and recall. Assimilate all the contents of your brochure like the text copy, company logo, contact details, product photographs and specifications etc. Decide their placement and alignment in the brochure to finalize its design. Big ideas emerge for brochure printing but most f them go down the drain due to budget constraints. Finalize your budget and fix it first to decide the criteria for brochure printing. If you are lucky enough to get a good print supplier, he will suggest ways to get the desired results within your budget. How is your brochure going to be delivered? – by hand, by post or placed at a stall for pick-up. This essentially determines the brochure size as only regular sizes are suitable for posting. Brochures which have an irregular size normally do not fit into regular postal envelopes. Brochures delivered by hand or placed at stalls do not need envelopes. Those posted by mail need their own customized envelopes. If you wish to hand over the brochure to special clients or sent them by post, they must be enclosed in envelopes. Print envelopes of the same design as the brochure to ensure consistency. The success of a brochure depends on its efficient and timely printing. Brochure printing depends a lot on the print supplier it is handed to. Select a print supplier who has ages of experience in this field and is an expert in his/her own right. with such an expert by your side, your brochure printing is never going to fail as he will rightly guide you on the dos and don’ts of brochure printing. If you still have doubts, read our next blog on the dos and don’ts of brochure printing to learn more about the tricks of the trade. Check if the print supplier also has a design facility to help you in evolving the perfect brochure design. A good supplier will always be committed and deliver your brochure within time. The print vendor will also be open to comments and feedback and be supportive throughout the brochure printing process. Find such a seasoned print supplier and entrust your printing in his safe hands to get the best of brochure printing.